Studiocanal is currently in the process of restoring some of the lesser-known titles from Ealing's back catalogue for a debut Blu-ray release. The latest to benefit from a 2K digital spit-shine is Charles Frend's straight up and down biopic of the titular British adventurer, tragically frozen to death with his comrades in 1912 on their return journey from the South Pole, having just been pipped to the post by dastardly Norwegian rivals. 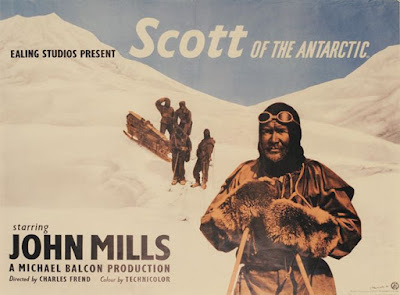 Frend's film draws on Scott's recovered diaries, taking us from the explorer's dogged early fundraising efforts in provincial town halls through every step of the group's long march in vain, the icy wastes of the tundra recreated somewhat creakily at the studio's West London sound stages. John Mills stars as Scott, imbuing the role with the sort of chirpy, can-do pluck we don't much go in for these days. 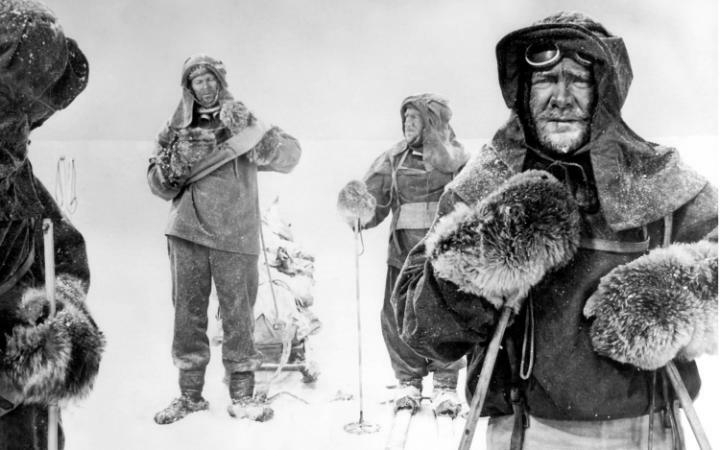 An interesting aspect of the great man's character stressed here is that he made a fatal error in insisting that the Terra Nova expedition take new-fangled mechanical snowmobiles with them in favour of additional huskies, ignoring the advice of his experienced peers in the name of progress. An unfashionable technophobic moral is thus hinted at but not dwelt upon. Scott's team are made up of reliable character players like James Robertson Justice, Kenneth More, Reginald Beckwith and Derek Bond, the latter a rather chinless Nicholas Nickleby a year earlier but here very affecting as Captain Oates, clinging absently to a slim volume of Tennyson in the group's wind-battered tent before uttering his immortal exit line: "I am just going outside and may be some time." A commendably businesslike if rather fusty tale of human endeavour against the elements in the manner of Touching The Void (2003) and Everest (2015), Scott Of The Antarctic does pack in some winning moments of pathos: an otherwise jolly scene in which the men say goodbye to their wives and sweethearts before setting sail is freighted with sorrow by our foreknowledge of their historical fate; the team later having to execute their ponies to survive, the gunshots ringing out and prompting howls of terror from their anguished sled dogs. Perhaps the best reasons for those without a prior interest in its subject matter to seek out Frend's film are Ralph Vaughan Williams's grand and ghostly original score and Jack Cardiff's bold blue and blasted white cinematography, the latter finally given its due in the spanking new format.